Sales and marketing training shows you a simple effective process, that any business can use, to generate new customers and sales appointments from marketing and prospecting campaigns. Save your time by using a proven prospecting technique to market your business. Many small businesses and large organisations are stuck in a 20th century mindset when it comes to marketing ideas. On this page you'll see a simple modern process on how to prospect using a cost effective marketing list. This sales prospecting technique works for large companies and small business sales. Try it out and you'll get a great return on your investment. Using the sales and marketing training on this page, along with the others in the sales prospecting section, you can easily bring in a steady flow of new sales opportunities. To get the best return on bringing in these prospects you want to convert as many as possible into sales appointments. 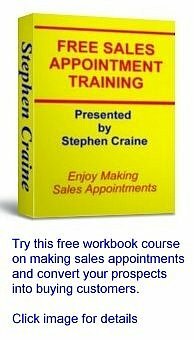 Take a look at the free sales appointment course based on the training I give to my working sales teams by clicking the image above or opening Free Sales Training on Making Sales Appointments. The marketing process for sales prospecting shown below is recommended by David Sklorenko III, President of Buy-Direct-Mailing-Lists.com and an expert on the use of mailing lists to grow businesses. Listen to David's sales and marketing training advice and consider how your business could benefit. Contact a marketing list broker to do the work for you. They will provide you with valuable information that you probably didn’t even know existed. Put your sales efforts into using your sales skills to make appointments and close sales. Use the following sales and marketing training to boost your profits and get your phone to ring. That’s the goal, develop a relationship so that you don’t have to make any calls. Ranging from $.03 to $.30 per record how can you not afford that. The right mailing list for you can include address, sales volume, decision maker’s name, employee size, number of computers, rents/owns building, years in business, etc. Implement the following steps into your basic sales structure and your sales will sky rocket. 1. Define your target market. Your perfect prospect. Your competition’s perfect customer. 2. Partner up with a List broker, who can provide you with the most up to date records available. 3. Send out, or personally hand out a flyer to the recipients on your marketing list, maybe even include a fax back section. 4. Follow up with a call regarding the flyer. This sets you apart from 95% of all telemarketers. 5. Repeat the above steps. 3. Call your prospect informing them that they will receive an outstanding offer in the mail. 4. Mail out the offer with a call to action, possibly a fax back section. When choosing a mailing or marketing list make sure the list broker has up to date records. Also it might be best to purchase the list for unlimited use for 12 months. Don’t think you can buy a list for a one time use and repeatedly use it. The fines for this type of manipulation are in the thousands, list owner salt the lists with seed records to track this misuse. Your goal is to spend your time on closing deals and developing relationships. Have your phone ringing with qualified leads. “No one likes to be sold to, but everyone loves to buy.” Use a list broker to help those buyers to find you. Many small business sales operations still haven’t realised the massive benefits of the Internet and how it has revolutionised sales and marketing. Customers now expect all businesses to have a website. Websites are viewed and assessed in the same way bricks and mortar premises used to be. Buyers will judge your company by it’s website. Too flashy for your market, or dull and boring, that’s what they will think of your company. And if you haven’t got a website you are losing business. Even the smallest part-time, one person business needs a website. If you haven’t got one, or you’re not happy with the results from the one you have, take a look at the company I use. I know it works because it brought you here. They're called Solo Build It,click here for more information about what they can offer you. I can highly recommend them. You've taken action to bring in sales prospects, now you want to turn them into sales appointments. The more effectively you convert sales prospects into sales appointments the more opportunities you get to make a sale. To get the best results make sure you have a really effective sales appointment call. 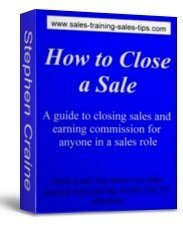 Take a look at the training course I use with my working sales teams. It uses step by step exercises in a training workbook to buld an appointment setting call that is unique to you. Developed with working sales people on real sales appointment calls, and now used by sales people, appointment makers, and many small business sales offices and self employed businesses. You can start using it today and see a real increase in how often you get in front of buyers by opening How to make sales appointments and cold calls. Have you got a question or can you make a comment about marketing and sales prospecting? Can you leave feedback about this page that will help others? You can ask questions, make a comment, or write an article about sales and marketing training on prospecting. You can write anonymously, add your name, or even add a few brief lines about you and your business and include a link to your website or add your contact details. This will be a free advert seen by thousands of visitors to this site. To send your comments or questions open the Sales prospecting comments box and simply click and type. 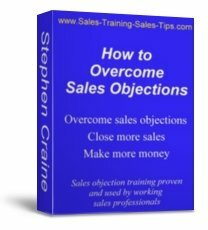 For more sales prospect training open Sales prospecting tips page and leave sales and marketing training. To start a new search for more sales training move from Sales and Marketing Training to the Sales Training Sales Tips home page.